Argan Oil is gaining popularity in the beauty industry and for good reason. Argan Oil is extracted from the kennel of the Morocco based Argan tree. It is packed with a number of beneficial nutrients that can help restore, rejuvenate and reduce the signs of a number of beauty ailments. Argan Oil contains Vitamin E, fatty acids, phenols, carotenes, squalene and many antioxidants that can help you improve your skin and hair. The Vitamin E in Argan Oil is highly beneficial for those who suffer from dry skin. It acts as a natural moisturizer to hydrate skin and reduce dry areas, cracked lips, treat xerosis, reduce atopic dermatitis and treat xerotix eczema. Those who suffer from acne will benefit from the antioxidants found in Argan Oil. Argan oil can help reduce the inflammation caused by mild acne breakouts. These antioxidants can also help reduce fine lines and wrinkles on the face. The agents in Argan oil helps natural repair damaged skin cells leaving the skin plump, soft and nourished. 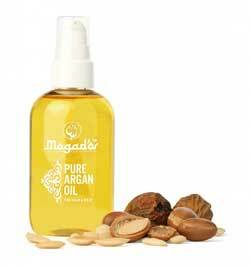 Argan oil can be used directly on the skin without leaving is oily or greasy. It can be massaged into the skin to help reduce stretch marks or applied to the skin to heal cracked and extremely dry areas. You can add Argan oil into many of the beauty products you already use on your skin including face masks, moisturizers, body lotion, bronzer and face creams. For hair the Vitamin E component in Argan Oil can help reduce frizz, add shine and treat split ends. The Vitamin E also helps protect the hair from UV damage. Those who suffer from dry and damaged hair will benefit from using Argan Oil because it nourish the damaged hair while also protecting it from further damage. The fatty acids found in Argan Oil can help as a detangler when mixed with other serum hair products. Argan oil is a dry and light oil so it can be conveniently left in the hair without leaving it oily. Argan Oil can add a natural shine to your hair without leaving it feeling or looking greasy. You can use Argan Oil directly on your hair or it can be mixed in with a number of you other hair styling products. Argan Oil is also highly beneficial for you nails as well. Massaging a few drops of Argan oil on the cuticles of your nails will not only smooth out the area but can promote nail growth. If you have brittle or damaged nails Argan Oil can help restore and strengthen your nails. When applied directly onto the nails the Argan oil can bring out a natural, clean and healthy look over your nails. Argan Oil is an easy to incorporate ingredient into many of your everyday beauty routines that can have some remarkable effect. Argan Oil is versatile and can be used directly on the skin, hair or nails or it can add to the products you already use.